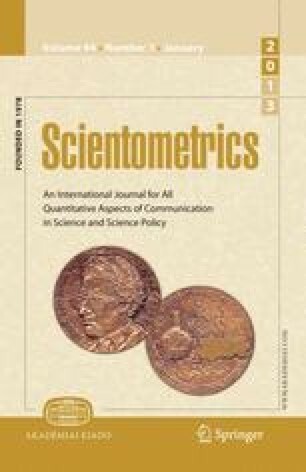 We introduce a new quantitative measure of international scholarly impact of countries by using bibliometric techniques based on publication and citation data. We present a case study to illustrate the use of our proposed measure in the subject area Energy during 1996–2009. We also present geographical maps to visualize knowledge flows among countries. Finally, using correlation analysis between publication output and international scholarly impact, we study the explanatory power of the applied measure. We are thankful to Prof. Henk Moed and Prof. Yuan Sun who provided their useful comments on early stage of this research. Alok, J. (2011). China ‘leads the world’ in renewable energy. Guardian. http://www.guardian.co.uk/environment/2008/aug/01/renewableenergy.climatechange. Accessed 03 March 2011. Bradsher, K. (2010). China leads global race to make clean energy, New York Times. http://www.nytimes.com/2010/01/31/business/energy-environment/31renew.html?_r=1. Accessed 3 March 2011. Callum, C. (2010). China’s Clean Revolution report. Global Director of Communications .http://www.theclimategroup.org/_assets/files/China-Clean-Revolution-III.pdf. Accessed 3 March 2011. Kinver, M. (2008). “China’s ‘rapid renewables surge’”. BBC News. http://news.bbc.co.uk/2/hi/science/nature/7535839.stm. Accessed 3 March 2011.